Q. - What is the physical address of the airport? A. - For driving purposes, MIA's intersection address is 2100 NW 42nd Ave, Miami, FL 33142-- More. Q. - Where can I find maps of the area with directions to the airport or surrounding areas? A. - Go here, view maps in Mapquest - Yahoo - Bing. Q. - Where I can find information about connecting flights? Arrivals and departures? International arrivals (U.S. Customs)? Airlines' ticket counters? Flight times (real time) information? A. 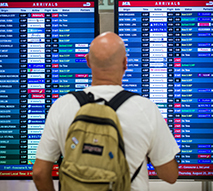 - Connecting flights- Arrivals- Departures- Where to park- International arrivals- Ticket counters - Flight times - Flight Tracker. Q. - Where I can find information about connecting flights? Q. - Where are the cruise lines counters / representatives? A. - Service Counters: Carnival Cruise Lines - Cruiseport Destinations - Holland America - Norwegian Cruise Lines - Princess Cruise Lines. Other service counters: Airline Ticket Counters - Tourist Information Center. Q. - Where are the smoking areas, once I pass the security check points? A. - There are no smoking areas past security checkpoint. Smoking is permitted only in designated curbside areas on the first and second level, across the street from the terminal. Q. - Do you have locker storage or long-term baggage storage in your Airport? A. - No, passengers may only store baggage in the baggage storage facilitylocated in 2nd level. More. Q. - Do you have a hotel inside the Airport? A. - Yes, Hotel MIA, located in 2nd level. Visit www.MiaHotel.com or call 305-871-4100. Accommodations - Amenities - Contact Us - Groups & Meetings - Photo Gallery - Reservations - More. Q. - Do you have duty-free shops in your Airport? A. - Yes, there are Duty Free stores in all three terminals. For exact locations, click here. Q. - Do you have shower facilities in the Airport? A. - Currently there are no shower facilities in the airport, except in some airlines' clubs and lounges. Q. - How much are the taxes for international flights? A. - Taxes are usually added to the ticket at the time of purchase. For additional information, please contact your airline. Q. - Do you have a business center in the Airport? Wi-Fi? Internet access? A. - Yes, there is a Business Center in - connector, post-security checkpoints. There is Wi-Fi access in all terminals. More. Q. - Are there things to do on a layover? A. - If you have 3 to 5 hours between flights, here are some suggestions. Other options: MIA Art Gallery- Traveling with Children- Shopping, Dining and Services- MIA's Useful Links- or visit the Tourist Information Center located in the 2nd level (Hrs: 6:00am to 10:00pm daily). Q. - Where can I find information regarding hotels and motels in the Miami area? A. - View MIA's Useful Links for more information. Q. - Is there courtesy transportation from Miami International Airport to my hotel? 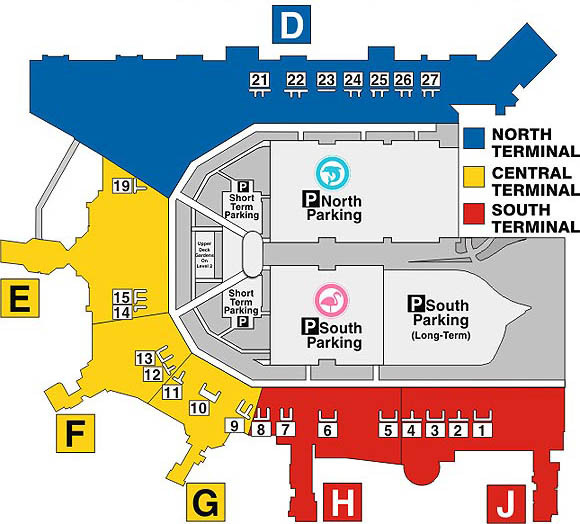 Hotel shuttles pick up and drop-off areas are located on the upper (departure) level of the airport (view map). Q. 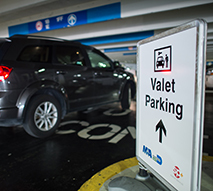 - What are the Parking Options available at MIA? Where is the disabled parking located? A. - The options are: Valet Parking- Self Parking- Payment Options/ Sun Pass Plus. All parking alternatives are available 24 hours a day. Click here to view all Disable Parking areas. Q. - Where should I park? Where are the airlines located? Are reservations required? Are there any discounts or parking passes? Can we pre-pay our parking fees? A. - To park closest to your airline, click here for a map location of airlines and parking options. No reservations are required. There are no discounts or parking passes for any of the parking facilities at MIA. Q. - What forms of payment are accepted for parking? and credit cards (Visa, Master Card, American Express, Discover and Diners). Q. - Do you have "express" pay lanes at MIA? A. - Yes, lines are labeled "CREDIT CARD," More. Q. - What can I do so that I don't lose my ticket? A. - You can insert your credit card at the entry ticket machine and use the same credit card at the exit terminal. You will be charged accordingly and allowed to exit. Q. - What happens if I park longer than 60 days? A. - Prior to reaching 60 day limit a letter will be sent to the registered owner of the vehicle. If we receive no response to the letter the vehicle will be towed away at the owner's expense. View where to park closest to your airlineor parking options and rates. 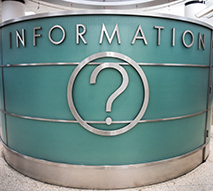 For Frequently Asked Questions (FAQs) about MIA's Metrorail Station, Metrobus services, Miami Intermodal Center and Miami Central Station, click here. Q. - Where can I obtain ground transportation from Miami International Airport, via shuttle or taxi? A. - Taxicabs and SuperShuttle vans are available on the arrival level (level 1), outside the baggage claim area. Hotel shuttlesare available on the departure level (level 2). More. Q. 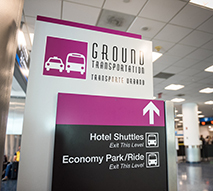 - During what hours is ground transportation available at Miami International Airport? A. - Ground transportation is available 24 hours per day. Q. - What is the cost to travel by shuttle van or taxi? Are reservations required? A. - Costs vary by destination (see rate chart). Reservations are not required for SuperShuttleor taxicab service originating from MIA. Rates for taxi and shuttle service are also posted on the ground transportation kiosks located on the ground level of the terminal, outside the baggage claim areas. More. Q. -How passengers get to and from the Rental Car Center (RCC)? A. -Passengers connect between MIA and RCC via the new MIA Mover electric-powered train. The MIA Mover train station at the airport is located on the 3rd level between the Dolphin and Flamingo Garages. Use the 3rd level Skyride (moving walks) to access the MIA Mover station. Q. - What is the telephone number for SuperShuttle? A. - The number for SuperShuttle information and reservations is 305-871-2000. Q. - How do I go from the airport to South Beach, Downtown, Lincoln Rd, Bayside by bus or train? A. - You will find public transportation fares, routes, schedules and interactive maps here. Q. - What types of transportation options are available from Miami International Airport to the Port of Miami? A. - The services available on demand are taxi service (view rates) and SuperShuttle(24 hrs. a day, reservation not required). Other options include public transportation (view routes and schedules)and pre-arranged ground transportation services, including bus and limousine. View driving directions to the Port of Miami or visit the Port of Miami website for additional information. Q. - What type of transportation options are available from Miami International Airport to Ft. Lauderdale Airport (FLL)? A. - The services available on demand are taxi service (view rates) and SuperShuttle(24 hrs. a day, reservation not required). Other options include pre-arranged ground transportation services, including bus and limousine and Tri-Rail Commuter Train Service , located just outside the airport (free shuttle service to and from the train station is available the lower level 1st level bus station). Please contact Tri-Rail directly to inquire about the rates and schedules for the train service. View driving directions to Ft Lauderdale Airport or visit Ft. Lauderdale Airport (FLL) website for more information. Q. - How can I obtain information regarding the Tri-Rail Commuter Train to travel between Miami and Palm Beach? A. - Based on zone travel, round trip prices range on Tri-Rail from $3.50 to $9.25 (reduced prices for senior citizens, students, children ages 5-12, disabled passengers and Medicare recipients.) Call toll-free at 1-800-TRI-RAIL, 1-800-273-7545 (TTY), or visit www.Tri-Rail.com for more information. Q. - Where I can find statistics about MIA? Q. - Where I can find phone numbers and contact information about MIA's staff, airlines, and business partners? Q. - How can I volunteer at MIA? How can I nominate an employee for Reward & Recognition? Are there Protocol Services? Can I take a tours of MIA? Q. - What can I do with my children at the airport? A. - Visit MIA's Kids Corner for more information. Q. - Where I can find information about cargo? General Aviation Airports (GAA)? Q. - Where I can find additional information about MIA and South Florida?